A couple years ago, I briefly had a site at poploser.tv. I filled it with weird videos and movies from around the Internet, but never kept it up and eventually it lapsed (that’s the story of most of my web projects). Last week I was reminded that YouTube really is a treasure. There’s just so much… stuff. YouTube has a whole weird sub-culture (several, actually), but the site is most amazing as an archive and a look at what TV used to be, which seems less, but more, than what TV has become. While re-watching old episodes of Twitch City (the greatest TV show ever made), I thought about PLTV and what I wanted to do with it and decided to try again. I’m working out some bugs and trying to get the perfect mix of videos, but the new site is mostly designed just to be left on. You can go there and let it play (auto-play isn’t working on mobile yet), enjoying the ephemera of what television was in all its wonderful weirdness. 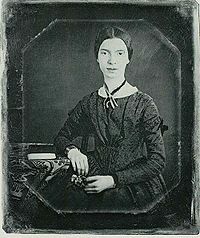 As we lean back, we might send elegantly composed birthday greetings to Emily Dickinson, who was better known during her life as a gardener and botanist than as a poet; only 7 of her 1775 poems were published in her lifetime– which began on this date in 1830.